Just because I like the sound of this one. I tripped over it in my wanderings for new music. Enjoy. This is the first time I've done something like this, assuming you don't count those short stories that became extras in A Pius Man. This is actually from my current novel in progress, entitled Codename: Unsub. It will probably come out after A Pius Stand, especially since A Pius Stand is damn near done. 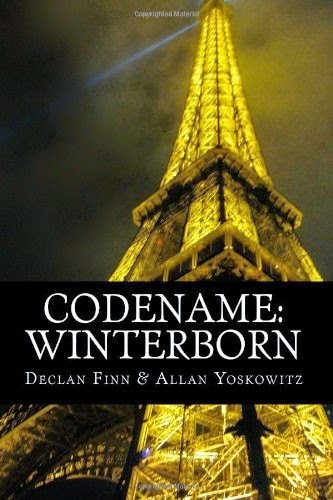 If you don't know the plot of Codename: Winterborn, you shouldn't have anything to worry about. However, that being said, please read the book already. Anyway, the prologue to the next Finn and Yoskowitz novel, Codename: Unsub, is below the break. Let me know what you think. While I have no problem with you pointing out errors (crowdsource editing ... works for me), and if you decide to lynch me for a few errors, well, I'm writing three books at the same time, doing most of the copy editing, line editing, proofing, while also being the primary marketer, and maintaining a blog that posts once if not three times a week. When you do the same, let me know. Editing help, good. Heckling? Bad. Yeah, you didn't think that yesterday's post was EVERYTHING at E3 that looked cool, did you? Oh, and Halo is back. And then there's this. I want this game. I want it now.... and I'm still playing the first one. Dang it. Then there's a book-inspired video game that makes me want to read the books and play the game. And there's another Assassin's Creed game, if you care. I hate E3. It makes me want to buy systems and games I probably can't afford. Damn them. Far Cry 4 looks like a lot of fun. In fact, I'm going to link to the two videos and the commentary I have over at American Journal. Enjoy. There's also a look at the new Battlefield, Cops and Robbers. That's not the title, but it should be, darn it. Bayonetta 2 ...... I loved the first one. It was just plain FUN. This was just hilarious. Zombies go into self parody. I've been doing a lot of writing lately, though not here. I've got Codename: Unsub to work on (the sequel to Codename: Winterborn), A Pius Stand to finish when the beta readers get back, and I'm working on Murphy's Law of Vampires, while I'm waiting for Damnation to get back to me on Honor At Stakes. To start with, there is the list of Arrow vs. Agents of S.H.I.E.L.D. And, damn, there were a lot of reasons. There is also what we're not going to miss from the Star Wars expanded universe, courtesy of The Mouse. You can check out any of my articles on The American Journal, if you feel like looking at me being cranky with the news, politics, politicians, life, that sort of thing, as I do my impersonation of a right-wing fringe lunatic.... or maybe just a lunatic. If that's not enough, I've got a fun bit of music for you today. Now, pardon me, I have to keep working. I hear that DC did something else stupid over the weekend that I have to rant and rage against.